Transforming your living room can be easier than you may think. Try these simple steps to freshen your living room. Country living – Country style living rooms are relaxing and warm. To create a country style space, look at living room furniture made of wood plus a comfortable couch. Quilts and throw pillows will also add to making your space more comfortable. Start off by choosing a country style color pallet, think of colors like brown, beige, maroon and burnt orange. Modern décor – If you prefer a modern style living room, look at bright walls mixed with white spaces. 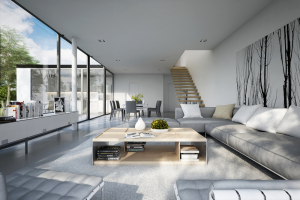 Glass tables and white furniture will help complete your look. You could also look at hanging abstract artwork to add personality to your space. Plants in the form of palms or cactus will provide a sense of freshness to your space. English country style – If rustic is your thing, look at an English country style space. Consider adding patterns, drapes, and cushions in browns and reds to complete your look. You can also display items on your mantels or tables that focus on your theme. Chinese style – If you’re looking for a dramatic change then consider a red themed Chinese style space. Look at investing in dark furniture and add red paper lanterns and porcelain items to decorate your mantels and fireplaces. Victorian style – For a 19th-century feel, look at colors in rich purples, reds, and greens mixed with large chairs with round edges in rich fabrics like velvet. Start with a white or cream base color and add furniture and upholstery as you build your theme.